Matching Grant Project sites in Mexico. You may recall having read about Rotary CFD's visitation to the Rotary Project Fair in Oaxaca earlier this year, and of its desire to partner with Mexican Rotary Clubs on the two projects that caught Schwandke's attention. That desire has now become reality, with both projects having been approved by their respective Clubs and Districts. Subject only to final approval from the Rotary Foundation, work on these projects is expected to be completed this summer. Project #2 is much more ambitious... and involves construction and trenching for 2,000 feet of sanitary drainage for the village of Crutzitzin, near the town of Tezuitlan, in the mountains of northern Puebla state. It is a village of approximately 80 homes and a school , but no sanitation system whatsoever. A Civil Engineer and Architect, who are members of the Texuitlan Rotary Club, donated the design plans which sliced thousands of dollars from the cost to build the system, which includes 14 junction wells. Even so, the cost will exceed $25,000. This sanitation project required $4,600 in seed money from Rotary Club of Chicago Financial District. The Mexico partnering club in Teziutlan, along with matching grants from District 6450 and 4180 combined to add another $9,400. A matching grant from The Rotary Foundation will account for the remaining balance. (Members can see more photos and commentary by clicking "Photo Page List" in the menu). When Rotarian's travel to foreign countries to work on projects like these, they are usually hosted by members of the partnering Rotary Clubs. Your host typically provides room, board, and transportation during your stay. It is an economical way to travel, to meet new people and learn a country's culture from those who live it. At the same time, you are doing good deeds and building lasting friendships. If you would like to participate at one of these project sites, or learn about other travel opportunities with Rotary International, please contact Rotary CFD member John Schwandke. "My intent was to find one good humanitarian project that filled a need in one of the areas our membership has expressed interest in", He said. Instead, he came back with two! The photo on the left is the booth sponsored by the Rotary Club of Teziutlan, who wants our help on a sanitation and water project. The people of the Chignautla-Crutzitzin village contacted the Teziutlan Rotarians and asked for their help. They have no sewage system, defecate in open air, and are experiencing serious health issues and a poluted drinking water source. There is no government resource to help them. The men of the village will do the hand labor and a Rotarian, who is also a Civil Engineer, has already drawn the plans. A plus to the project is the positive affect it will have on the community's drinking water source. The right-hand photo shows John and Darlene with members of the Rotary Club of Puebla Virreinal. This is a new Club, having existed for only 18 months. The members are young and energetic. Their proposed project includes creating a computer classroom for an impoverished school for orphans and transform it into one of the communities more progressive schools. Demonstrating the significance of the Rotary Foundation's Matching Grant program... an investment of $2,150 from Rotary CFD would result in the entire $12,950 needed to complete the project. 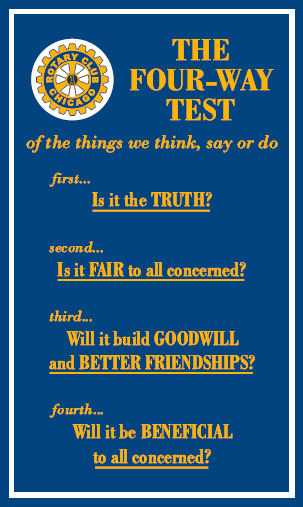 As you already know, the Rotary Year runs July 1 through June 30. For Matching Grants to be approved within the current Rotary Year, they must be submitted before the end of March to allow time for processing within the current year. Matching Grants not submitted by March 31, will have to wait until after July 1st before they can be submitted. The clock is ticking... and we'll see what happens. To learn more about Rotary World Community Service and other ways you can travel the world with Rotary, please contact Rotary Club of Chicago Fianancial District member John Schwandke. The opportunities are endless! Members wishing to see additional photos and commentary should click "Photo Page List" in the left hand column.